Afghanistan Revealed offers fresh perspectives on an ancient territory obscured by tales of tragic conflict. The compendium not only sheds new light, but offers fresh hope. It is essential reading. Afghanistan Revealed offers the reader an incisive view into a country that has held the world’s attention for more than a decade. Hardly a day goes by without Afghanistan making news in the media – but behind the headlines, what do we really know about this complex and enigmatic country, its people, its culture and most importantly, its future? 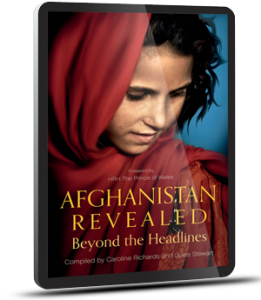 This ebook takes us beyond the media focus on politics and war into the lives of the Afghan people, and the forces that have shaped their individual and collective history. A range of distinguished specialists shed light on Afghanistan, from the earliest Aryan migrations and the emergence of Islam, through the country’s role as a key Central Asian trade centre, the Anglo-Afghan wars and the Soviet invasion, to the emergence of a post-Taliban state. We are reminded of how the Afghans have suffered in centuries of violent conflict and have stubbornly resisted all efforts to invade and dominate their land. We are presented with the tasks Afghanistan faces after the 2014 withdrawal of NATO-led combat troops, specifically the need to rebuild the country, create jobs, provide education, tap into its huge economic potential, and provide political and social harmony. Readable and accessible, Afghanistan Revealed is essential background for anyone wishing to understand why peace and stability in the region have been so elusive. It is also an indispensable tool for foreign and Afghan policymakers who play a role in determining Afghanistan’s future.